A green wall is a vertical structure that has different types of plants and other greenery attached to it. 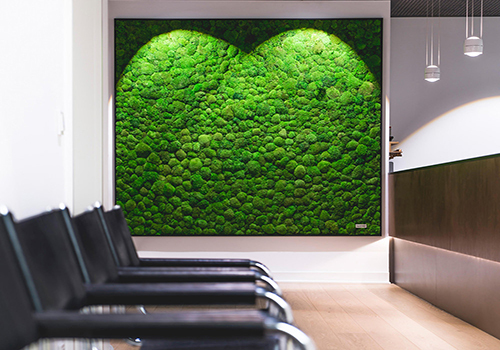 Living walls for indoor offices consist of panels with plants and moss. While being displayed, these panels are attached to a growing medium and then placed on the building’s walls, or attached to a freestanding structure, providing greenery and benefits of plants in the office. Also known as vertical gardens, living walls or eco walls are designed to provide green benefits within your office, as well as bring the trend of biophilia and natural influences into your building, while using a minimum amount of horizontal and vertical space. If you want to know more about Green Walls, read our comprehensive FAQs page. There are plenty of benefits to having a green wall within your office. 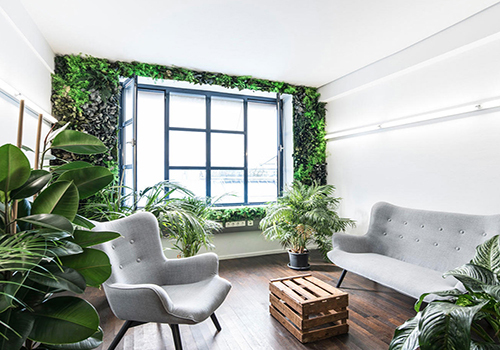 Green walls can seriously improve the health and the air quality within your office, as they reduce airborne mold spores and bacteria by up to 60%. Green walls also have sound proofing qualities as discussed in this study, because the plants help to naturally reduce and block high frequency sounds, and their supporting structure can help to reduce low frequency noises. They can act as a natural insulation for your walls, helping to better regulate the temperature within your office. 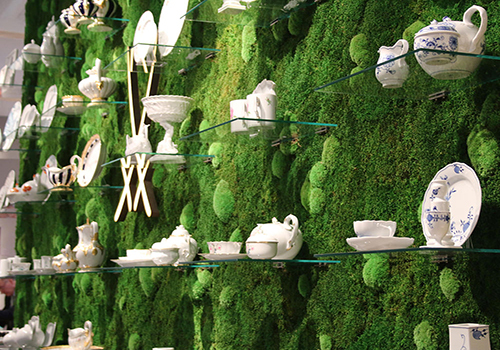 Living walls also help to increase employee morale and increasing creativity by 30% within your workforce. 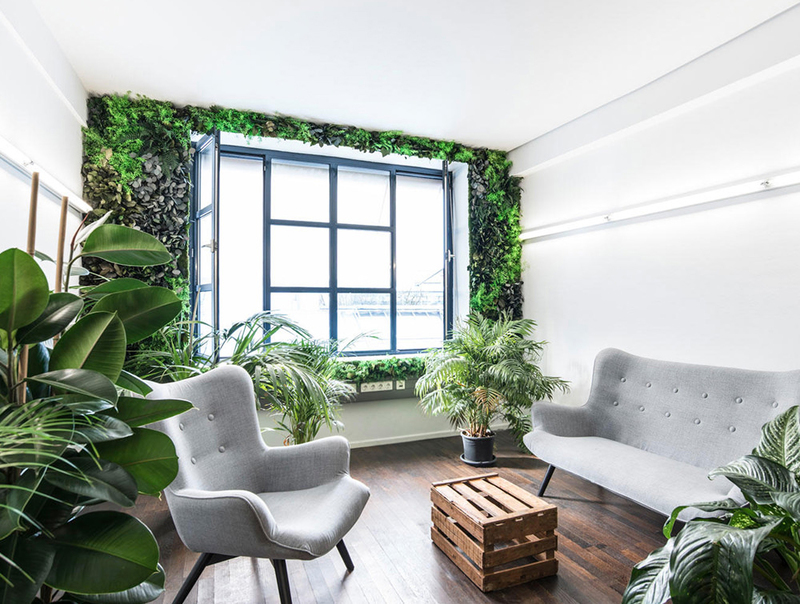 Green Walls require a bit more maintenance than other green office aspects, however you won’t be alone in their maintenance. To get the best from your green walls, most suppliers have a mandatory 1 year warranty and support to ensure they are properly maintained. This is important as the first few months after your wall is installed are the most crucial time in their lifespan, so getting the timing and irrigation correct in this period is vital. This support period is helpful to ensure that you will have the skills needed to support your wall once the warranty expires. Your green wall should be kept in the correct conditions where the foliage is not crushed and humidity levels remain under 70%. There are also alternative green wall solutions with maintenance free, such as Glycerine based plants. Water base green walls require a controlled amount of water to survive, moss based walls still require water just a lesser amount. Most green walls also operate using a drip irrigation system which are set up using an automated system. Ensuring they get the correct amount of water needed for them to thrive and look their best with little wastage. Recirculation irrigation systems are the most effective way to water these walls as they reuse water repeatedly, pumping water from top to bottom, until there is none left and the tank need to be refilled. Glycerine based indoor living walls don’t require water and they are maintenance free. They extract the indoor moisture as part of their own watering and maintenance process. Why should you invest in a Green Wall? Nothing attracts attention like the unique artistry created from stunning living plants. They automatically draw your eye to them and add interest and excitement to your space drawing visitors to your office. A well designed flourishing green wall can drastically improve a buildings appearance, adding colour and texture that will not go out of fashion. 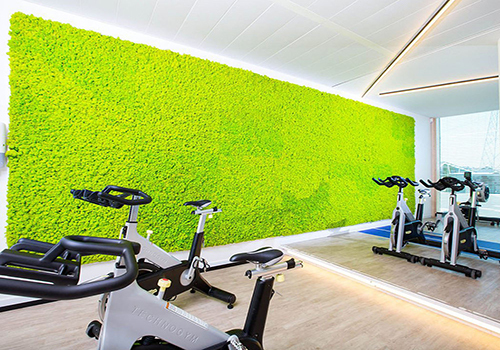 Living walls can also save you money in the long run as they help to clean the air which improves the health of your employees, ensuring that they are sick less often and reducing employee sick days. 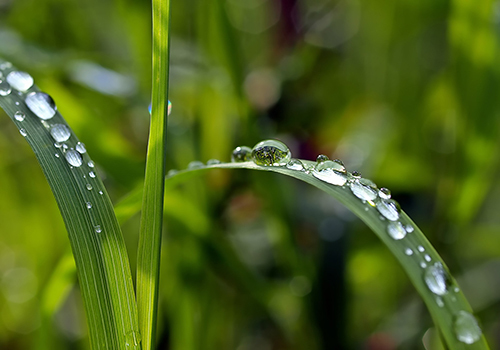 They also help to reduce energy costs as the plants act as natural humidifiers and air conditioners. Balancing the levels of humidity in the office, naturally cooling the air in the summer and acting as natural insulation during the winter, helping to reduce costly heating / cooling bills within your office. Tara McCamley developed an interest in digital marketing whilst studying for her Masters degree in Journalism. Tara joined the Radius Office content marketing team in October 2018 to learn more about the field and to expand her knowledge on marketing, while still being able to pursue her passion for writing.